Are Your Hands Sending the Wrong Message? You already know what dermal fillers can do to restore a natural-looking, more youthful appearance to your face. But did you know we can use some of those same fillers to renew the appearance of your hands as well? It’s true. Now, you can have hands that “match” your face when it comes to looking as healthy and young as you feel. The passage of time, and time in the sun, take the same toll on your hands as they do on your face. And even those of us who remember to use moisturizing lotions and sunscreen on our face and neck often overlook our hands. So, add gentle neglect to the list of reasons your hands reveal your age in ways you’d rather not see. What about those age spots? 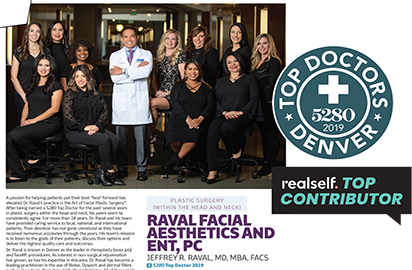 Dermal fillers can’t fix those, but we do have other treatment options that can address discoloration and spider veins. So we can re-plump your hands below the surface and restore the texture and your skin. The result? Smoother, younger-looking hands. Instead of hiding your hands in your pockets or under gloves, you can happily show them off again. Get out the bold nail polish! Proudly wear your favorite rings and bracelets again! And men? Don’t make the mistake of thinking dermal filler for the hands is just some girly treatment option. We know you’re using Botox and fillers to keep your own face looking refreshed and youthful, just like the women in your life. And we know you wish your aging hands could look as good as your face. Filler can complete the picture for you, too. Dermal filler treatment for the hands is fast, so it’s another one of our popular “lunch hour” procedures. You can easily slip an appointment into even the busiest schedule. 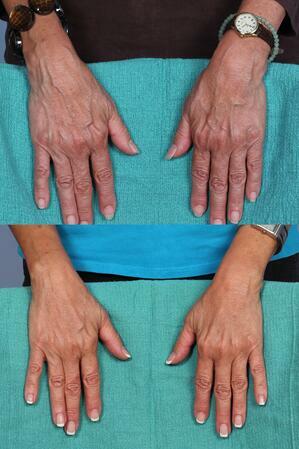 For the hands procedure, we inject the filler in multiple locations on the back of each hand. Then, we gently massage the material to spread it evenly throughout the entire area. All fillers produce temporary results, because they are made of natural ingredients such as hyaluronic acid. Your body will eventually absorb the material, but you can get refresher treatments to maintain those newly-smooth hands. How long the filler will last depends on the specific product we use, but a year is not unusual in the case of hand treatments. Some patients achieve even longer-lasting results. Most filler products contain lidocaine, or Dr. Raval may use a gentle numbing agent before making the injections. Even though our hands feel tender on the back, patients say the injections are surprisingly pain-free. You may have a little swelling or bruising at the injection sites for a few days, but other than that there are no after-effects. And, as we noted earlier, there is no downtime. Ready for “new” hands in the new year? Stop hiding your hands just because you hate the way they reveal your age. Make 2019 the year you see prettier (or more handsome) hands instead. All you have to do is call now to make an appointment.